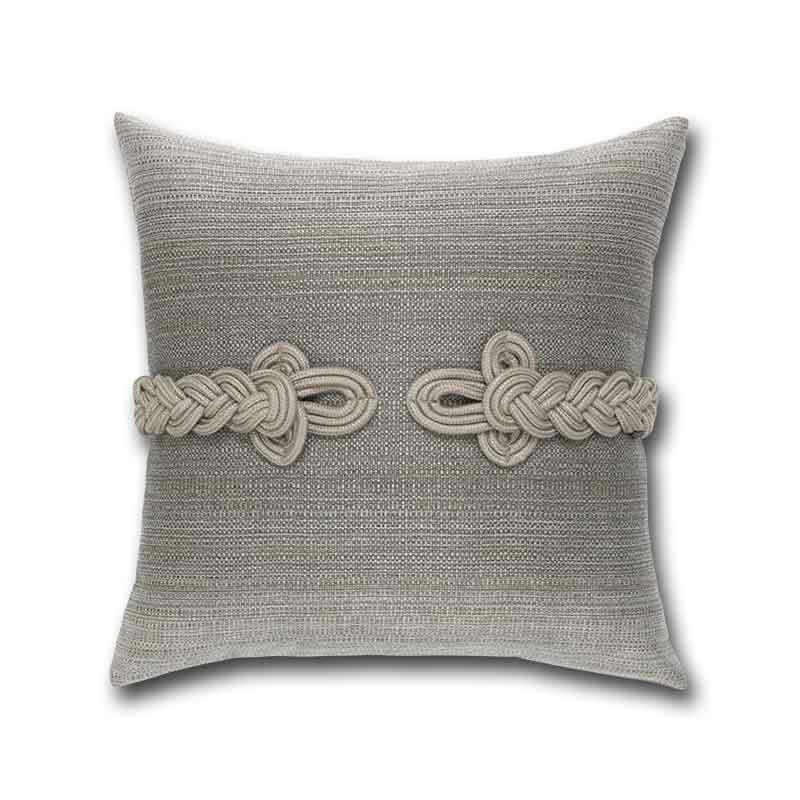 Our classic CADET FROG'S CLASP pillow adds a tastefully sophisticated embellishment to this textured cadet gray pillow. Filled with a sealed insert of 100% polyester fiber. The pillow fill never gets wet. 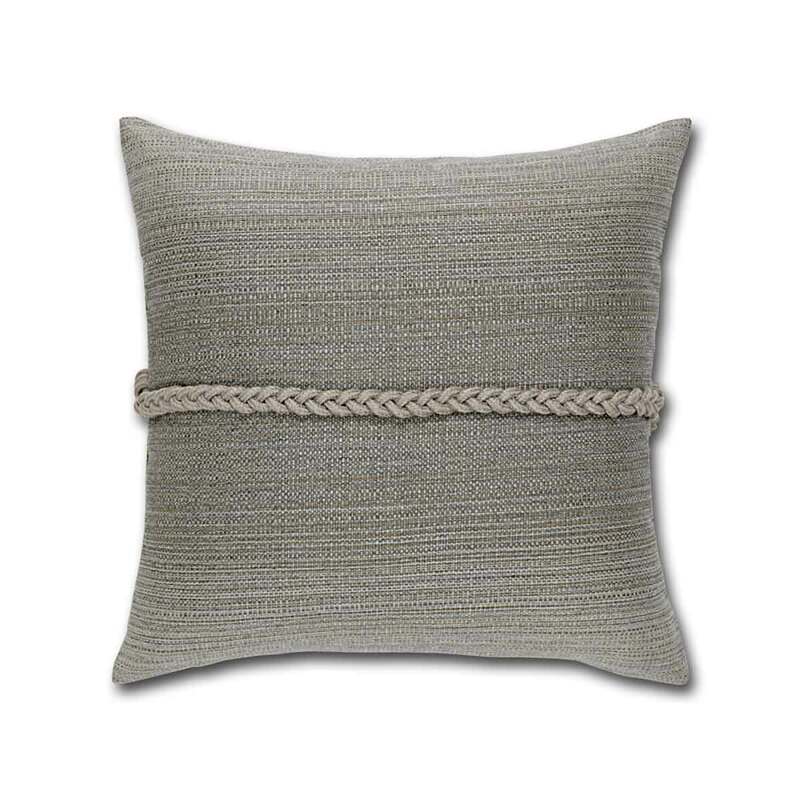 Tailored, Hidden Zipper allows easy cover removal for cleaning of each of these pillows. GENERAL CLEANING The best way to keep the beauty of Elaine Smith pillows enduring is to maintain them regularly. Brush off dirt as soon as it appears, shake off excess raindrops after a shower, and wipe up spills immediately. For seasonal cleaning, you may unzip the cushion covers, machine wash them in cold water with a mild detergent, and then allow them to air dry. SPOT CLEANING Should dirt or a stain appear to take root, spot cleaning will remove it. Simply apply a light mist of a gentle cleaning solution to the area and work it into the fabric fibers gently using a sponge or very soft brush. Rinse the spot thoroughly to remove soap residue, blot excess moisture, and allow to air dry. Repeat these steps as necessary to thoroughly remove more stubborn stains. HEAVY CLEANING Though Elaine Smith uses fabrics that resist mildew, it can sometimes grow on any dirt or foreign substances that become enmeshed in the fibers. To clean mildew and its residual stains, follow the spot removal steps using a cleaning solution of 1 cup of bleach and 1/4 cup of a mild liquid soap per gallon of clean water. For severe stains, you may increase the bleach quantity. PROFESSIONAL CLEANING Before contracting a professional cleaner, speak to them about their knowledge of fabrics treated for outdoor use and the special care that needs to be taken with them. 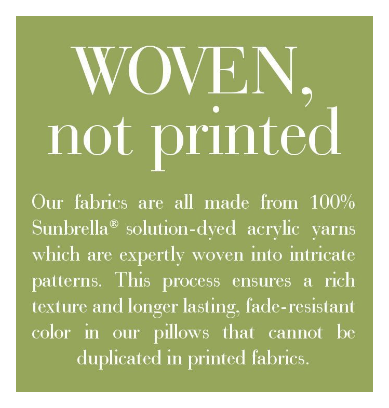 The fabrics are NOT dry-cleanable and should never be steam cleaned at a high temperature. Should wrinkling appear after cleaning, use an iron set on a synthetic setting that does not exceed 100°F/38°C. Test the iron on an inconspicuous area before using on the entire piece.